Adesso Spill-Resistant Multimedia Desktop Keyboard (AKB-132) is built to make handling your daily computer tasks easier. 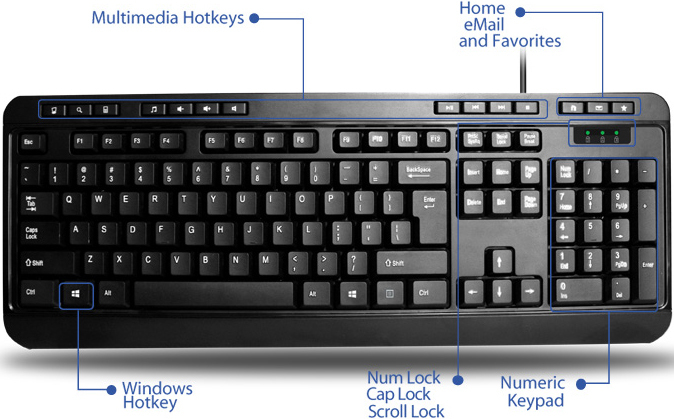 This keyboard features 14 hotkeys for quick access to your media player controls, email, Internet browser and other common applications like My Computer, Mail and Calculator. The AKB-132 uses quiet membrane key switches that provide a more quiet, tactile response. Available with either a USB or PS/2 connector. 18.35" x 7.4" x 1.26"
Control your media player with just one touch using the built-in Multimedia Hotkeys for easy access to your favorite video or music playlist. Instantly open your favorite Windows applications, such as My Computer, Calculator, Mail, or Search without having to navigate with your mouse. Package Dimensions 18.35" x 7.4" x 1.26"